I’m picky about what quiches I like. For me, some of them wind up being too darn eggy. Don’t get me wrong, I like eggs, but I need egg casseroles + quiches to have lots of other flavors + textures mixed throughout. So, when I recently stumbled across a recipe for a quiche filled with tons of arugula, shallots, bacon + cheddar, I thought, That sounds like the type of quiche I would love. And guess what? After making it this past weekend, I can confirm that I was right! This quiche, simply put, is amazing! It’s packed full of flavor – peppery arugula, salty bacon, tart balsamic, + sharp cheddar, all wrapped in a flaky, buttery crust. It’s light on the egginess, which makes it different from a lot of quiches, + just perfect for me. Another great thing about this? While it’s wonderful hot out of the oven, it’s just as tasty at room temperature, so it’s ideal for brunches or parties where it’ll have to sit out for a while. Up until recently, my easy potato, egg, + bacon casserole was my favorite savory egg breakfast, but it now has some serious competition. 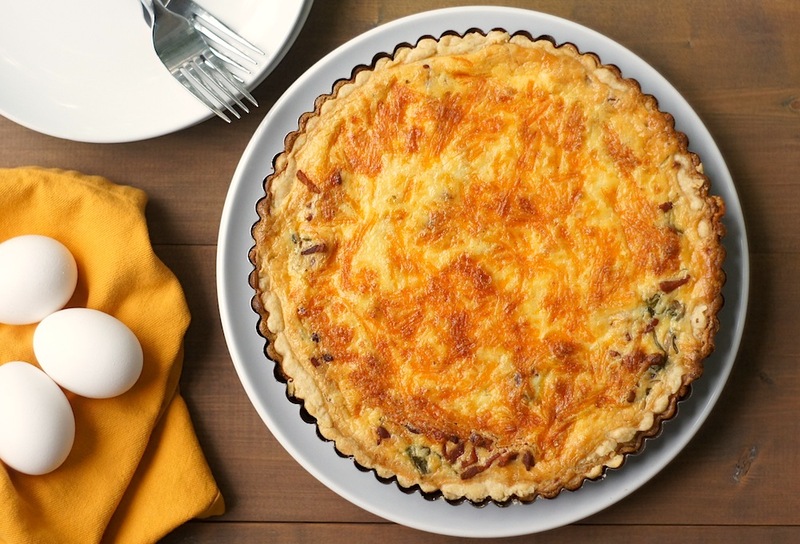 So, if you’re looking for a fantastic new breakfast dish, give this scrumptious quiche a try! Blend flour + salt in processor. Add butter + shortening. Using on/off turns, process until mixture resembles coarse meal. Mix in enough ice water to form moist clumps. Gather dough into ball; flatten into disk. Wrap in plastic + chill until dough is firm enough to roll out, about 30 minutes. Position rack in center of oven + preheat to 400°F. Bake crust until golden brown, piercing with fork if crust bubbles, about 20 minutes. Transfer crust to rack. Reduce temperature to 375°F. Cook bacon in heavy medium skillet over medium-high heat until crisp, about 5-8 minutes. Using slotted spoon, transfer to paper towels + drain. Add shallots to same skillet + sauté until tender, about 4 minutes. Add arugula + sauté until just wilted, about 1 minute. Remove from heat. Add balsamic vinegar; toss to combine. Sprinkle arugula mixture, then bacon over crust. Whisk cream, eggs, salt + pepper in large bowl to blend. Stir in cheese. Pour egg/cheese mixture into crust. Bake quiche until filling is slightly puffed + golden, about 35 minutes. Let stand 10 minutes. Cut into wedges + serve. This was my first time making a homemade crust and it was definitely delicious – way flakier and buttery-er than the store-bought version! But the pre-made crust could definitely be a great, easy shortcut for when you’re short on time! I definitely need to try this – I love some arugula and bacon – well it’s bacon. I’m a big time fan of quiche! I like just about any flavor. I love how this has arugula instead of the usual suspect spinach. Bacon & shallots too? Sold! Sounds like the most perfect of perfect flavor combos in that quiche. I’ll eat any ole quiche, but I’m like you in that I prefer ones that are packed with tons of delicious extras like veggies and baaaaahhhhcon. 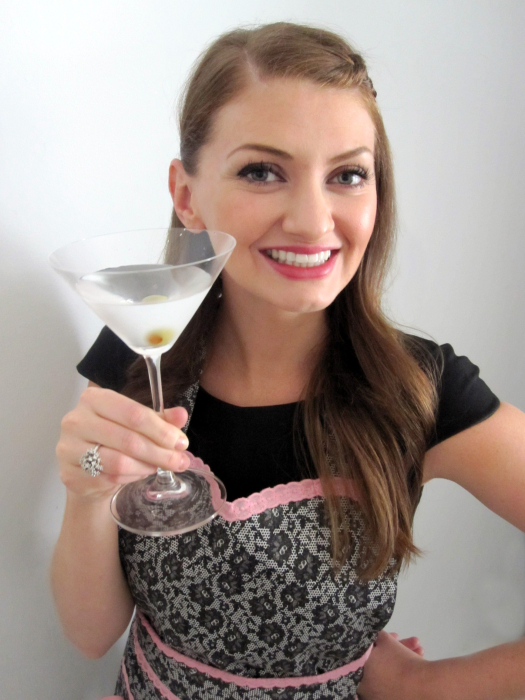 Thanks for sharing this fabulous looking recipe! I love that you made your own crust for this masterpiece! Salty bacon paired with spicy arugula is always a perfect combo. Yes, yes, and yes! All of my favorite things in a buttery crust? Do you deliver? It reheats wonderfully, Annie, so it’ll be perfect for your other half’s lunch the following day. I just reheated the last slice for a late breakfast this morning + had been eating it every day for the last 4 days since I made it. YUM! I love quiches loaded with goodies. This sounds divine Amy. Bacon and cheddar together is always a good thing in my book. Delicious! I’m definitely with you when it comes to quiche – I love it when they’re filled with goodness. This is such a tasty combination too. I’m with you – I don’t like an overly egg-y quiche, so this one sounds just perfect! I LOVE arugula! That sounds fabulous. 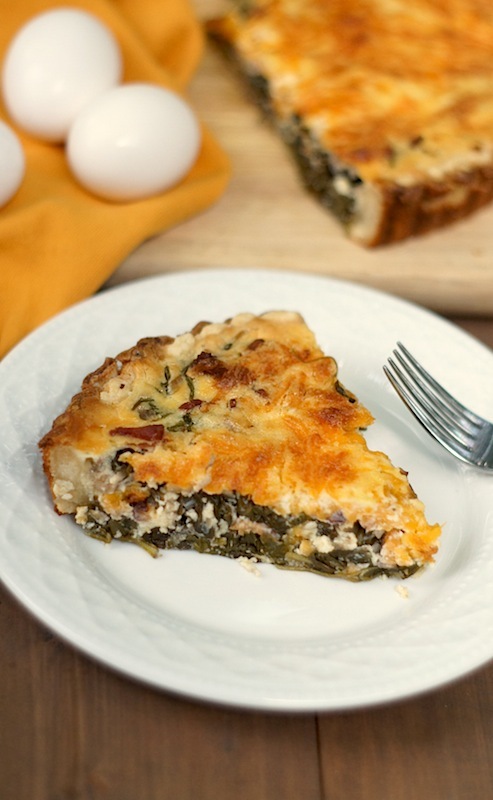 In Italy, Puglia especially, (in the deep south) they make a tart of greens and pancetta. It is a bit like this. Nice recipe! I never thought of arugula in quiche. I love it! This looks amazing! You made it sound so delicious! I absolutely must try this! Perhaps on a lovely Sunday morning. Yummy!! <3 Quiches can be quite challenging to make at times, especially when the inside doesn't cook as quickly as the outside! haha.. But this is definitely inspiring!! Yum – I love a good quiche and this one looks really delicious. I like the flavor combination a lot. Plus I like that they are good for any meal! Amy, this looks delicious! I love that you made your own crust here. I’m the same way, I like my quiches filled with loves of flavor! This definitely looks like one I could get into! sounds amazing!! i love quiches with a lot of other stuff in them too. otherwise they take forever to cook! Everything is better with bacon, and this looks like an excellent way to use up the farm share arugula in a form that my kids will enjoy. Good for you making your crust–I’m chicken. I admit it. Pizza dough is no problem, but pie crust?! Yikes. I think I’d love that quiche too. It’s all full of flavours I love! Wow that sounds really nice, i love quiche so definitely going to be giving this a go..